Blue and Blue - Silver Base - Lava LampThe first a..
Blue and Green - Silver Base - Lava LampThe first ..
Clear and Black/Plum - Silver Base - Lava LampThe ..
Clear and Pink - Black Base - Lava LampInspired by..
Clear and Turquoise - Black Base - Lava LampThe fi..
Red and Pink-Red - Silver Base - Lava LampThe firs..
Violet and Orange - Silver Base - Lava LampThe fir..
Violet and Red - Silver Base - Lava LampThe first ..
Yellow and Green - Silver Base - Lava LampThe firs..
Yellow and Orange - Silver Base - Lava LampThe fir.. The mathmos takes its name from the cult 1960s French Sci Fi comic strip Barbarella. The Mathmos is the bubble liquid force under the city. Barbarella was also made into a film in 1968 starring Jane Fonda with costumes by Paco Rabanne. How many products have stayed in continuous production for over 50 years? 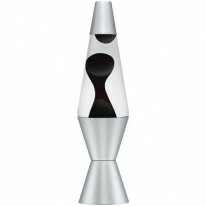 Our lava lamps have stayed relevant for over half a century. Meaning different things, to different people over time they continue to stay relevant to today. Astro is no 613 in Phaidon’s Design Classics. It was included in the “Design Icons Exhibition” at Harrods curated by the Design Council. Also in the “Design Classics” series in the Financial Times.